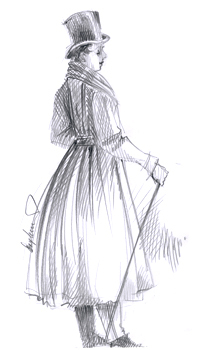 style of dress from the 1820-40 period. Influenced by industrialization and came to be favoured by a wide circle of wearers. Placed a particular emphasis on the modest and demure. 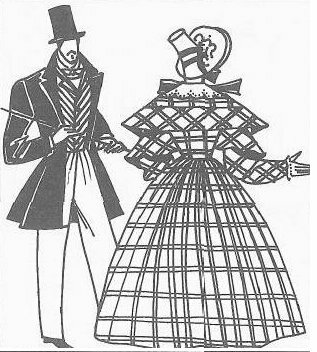 Most fashionable were patterned (especially checked) fabrics, and these were used for both men's and women's clothing. 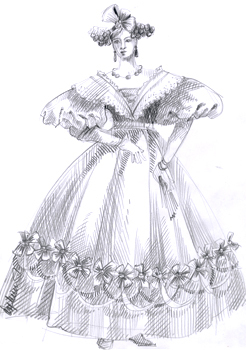 Women's clothing was composed of a bodice which fitted close around the chest, a skirt with many petticoats, a belt pushed up to natural height and a corset; the sleeves were extensive and bulky. 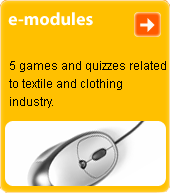 In winter a long woollen coat or capewas worn. Shawls, scarves and the fur boa were popular. In men's clothing the formal- and loungewear was the dress coat(evening jacket); this was close-fitting and was worn with long, narrow trousers and a coloured waistcoat. A topcoat became a popular part of this outfit.